Browse, filter, and use data easily on the top blogs in ASEAN-5 countries: Indonesia, Malaysia, Philippines, Singapore, Thailand. 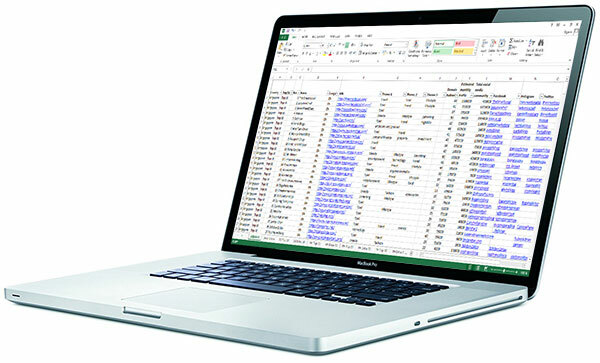 This ultimate Excel spreadsheet includes top blogs and related information about the most popular blogs from ASEAN-5 countries to facilitate your work, and make you save tens of hours, in your influencer marketing campaign, partner selection for content creation, social media collaboration or linkbuilding. Blogs and their relative data can be browsed and filtered very easily, with clickable URLs and social media profiles, for your specific purposes: by themes, by popularity, domain authority, estimated traffic, social media community size, etc. 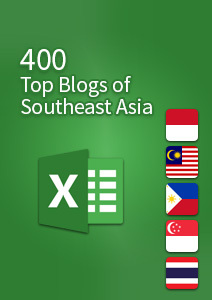 The main spreadsheet contains 400 blogs from the ASEAN-5 countries. The secondary spreadsheets list the top 50 blogs for each of the ASEAN-5 countries, Indonesia, Malaysia, Philippines, Singapore, Thailand, with an additional extra 30 good blogs per country, to help you work more easily on the list of blogs by country. The main “ASEAN-5” spreadsheet contains 400 top blogs from the ASEAN-5 countries according to 2017/2018 rankings. The secondary spreadsheets list the blogs for each of the 5 countries, Indonesia, Malaysia, Philippines, Singapore, Thailand, with one spreadsheet containing the “Top 50” for each country and a second spreadsheet containing another “Extra 30” good blogs. Here are the explanations of the data included in the spreadsheets, column by column. Country of origin of the blog. Some blogs are published by expats located in that country. Final rank in the Top and Extra. See notes. Language(s) of the blog. While most blogs are in English for most countries, many of the most popular blogs in Thailand and Indonesian are in the local language. Clickable URL Address of the blog. Most blogs have their own domain names but a few are hosted on Blogger or WordPress. Main themes of the blog. The themes for each Top 50 or Extra 30 have been separated in different columns to facilitate browsing blogs by themes in the main “ASEAN-5” spreadsheet. MOZ Domain Authority score at time of study. SimilarWeb Estimated Monthly traffic at time of study, when available. Recorded only for “Top 50” blogs. Total social media community at time of study, when available. Recorded only for “Top 50” blogs. Clickable URL Address of social media pages, when available. Only Facebook “pages” were recorded, not personal accounts. Recorded only for “Top 50” blogs.